Age Groups Open to students in prekindergarten (must be age 4) through grade 12. *Register for programs according to the grade your child will enter in fall 2019. WEEK 6: July 8-12 Camp Hours Morning Program: 9 a.m.-12 p.m. Lunch: 12-12:30 p.m. Afternoon Program: 12:30-3:30 p.m.
Extended Day Hours Before Care: 7:30-9 a.m. After Care: 3:30-6 p.m.
•	Register according to the grade your child will enter in fall 2019. •	After registering online, you will receive a confirmation email immediately. •	A registration fee of $15 per camper is required at time of registration. •	Course fees are located in the camp descriptions. •	Registration is not complete until payment is received. •	Payments are accepted in the form of credit card, cash, or personal check. •	Returned checks and ACH denials/ errors are charged $30 per infraction. Due to the necessity for a minimum number of students to be enrolled in every course, we must adhere to the following policy regarding cancellations. open to all families in the community and across the country, regardless of school attended. •	The program complements busy summer schedules by offering fullday, morning-only, and afternoon-only camps. •	Extended Day care is available before and after programs daily. •	You may register for one or multiple programs throughout the summer. The choice is yours. •	Registration is processed online. Enrollment is fast, safe, and easy. 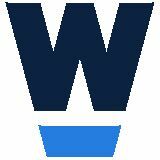 •	Registration opens February 1 at 7 a.m.
Online Registration •	Visit wellington.org/summer and click the Register Now button. •	Previously enrolled families should use their current login and password. For assistance, please email summer@ wellington.org or call (614) 324-8882. •	First time users, click Create an Account and follow the on-screen steps. •	Registration remains open all summer, so you can go back and add classes at any time. Waiting Lists •	All camps have enrollment limits to provide an optimal experience for campers. •	Once a class reaches capacity, you may choose to join an online waiting list. •	You will be notified via email if a spot becomes available and you will have 24 hours to accept the open spot. After the 24-hour window expires, the open spot is passed on to the next person on the waiting list. •	There is no fee or deposit to join a waiting list. •	A full refund, minus a $50 cancellation fee per class, will be given if you cancel a class for any reason prior to May 24. After that date, no refunds will be given unless a program is cancelled. Exceptions will be considered for medical circumstances (a letter from a licensed physician is required). •	Wellington Summer Program office reserves the right to cancel any program for which there is insufficient enrollment. All efforts will be made to assign students affected to another available camp. If placement is not possible, a full refund or credit for a future program will be granted. •	Refunds, prorated rates, or discounts will not be provided for camper absences, including vacation schedules or conflicting activities. •	If a child is removed for disciplinary reasons, there will be no refund. •	Lunch is provided by Wellington’s dining service company, Aladdin Food Management Services, and available for purchase at $30/week. •	Lunches will consist of a variety of kid friendly foods. Peanut butter and jelly sandwiches, milk, and fruit will be available daily. •	Students who have dietary restrictions must bring lunch from home. •	Lunch must be registered and paid for at least a week in advance to ensure availability. •	Campers are welcome to bring a sack lunch from home, however please note no refrigeration will be available. •	Enter on Reed Road and make an immediate right into the visitor parking lot. •	Please park in the lot and walk your child into the rotunda where members of our staff will greet you and assist in finding your child’s program location. •	DO NOT park along the curb in front of the main entrance of the school. •	Check-in directly with your teacher in the location of your program. Specific program locations will be emailed the week prior to your program start date. •	NOTE: If your child arrives before 8:50 a.m., he or she will be entered into the Extended Day program and charged the daily drop-in rate of $17. •	During one of our programs, your child’s photograph may be taken. 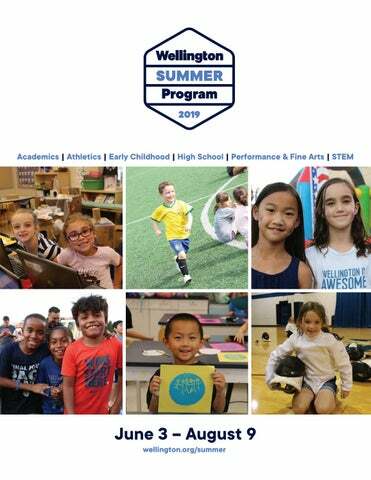 These photos may be used in future Wellington Summer Program publications, on the school’s social media accounts, the Wellington website, or other promotions. •	Please contact the Summer Program Director in writing prior to your child attending camp if you do not want your child to be photographed. •	Please park in the main lot in front of the school. Pick-up for students in prekindergarten – 4th grade will occur from the classroom/space where the program occurs daily. Pick-up for middle school students will take place in the rotunda with their instructor. Specific instructions will be emailed the week prior to your program start date. •	The teacher will release the student only to parents/individuals who are listed on the authorized pick-up list. You may log in to your account to add additional individuals to your authorized pickup list at any time. •	NOTE: If your child is not picked up by 3:40 p.m., he or she will be entered into the Extended Day program and charged the daily drop-in rate of $21. Field Trips •	Waivers are provided by email prior to the start of camp for programs that are not located on the Wellington campus. •	School busses provide transportation for off-campus trips as noted in the description of the program. •	Lunches are not provided on full-day field trips. Students must bring a sack lunch. Medication •	If your child must take medication while here, please complete the Administration of Medication form, available for download at wellington.org/summer. •	You AND your doctor must complete and sign this form before Summer Program staff can dispense medication to your child. •	Please provide an adequate supply of your child’s medication in a labeled container, including dosage instructions and the doctor’s name. If medication is not picked up within 30 days of the last administered dose, it will be discarded. HIGH SCHOOL FOR-CREDIT PROGRAMS Why spend the summer in class? Students value the ability to delve deeply into one content area without other demands on their schedule. For-credit classes help students fulfill a graduation requirement in order to free up space in their school-year schedule. •	Programs are open to students from any high school. •	Please check with your child’s school prior to registering for a program to ensure your school will accept the academic credit earned in our Summer Program. •	Daily attendance is mandatory in order to earn academic credit. •	You will earn 1/3 credit (the equivalent of one trimester) for the program you complete. •	Credit is documented through an official letter to the student indicating the summer course title, credit earned, and final grade. A copy of this letter may also be mailed to the student’s school upon request. •	Summer courses are aligned with the academic policies described in the Wellington Course Brochure and Policy Handbook. Course descriptions and dates are available on the following pages. Daily Camp Schedule Morning Program: 9 a.m.-12 p.m. Lunch: 12-12:30 p.m. Afternoon Program: 12:30-3:30 p.m.
Extended Day Before Care: 7:30-9 a.m. After Care: 3:30-6 p.m.
Grades: Prekindergarten-Kindergarten July 15-19, 12:30-3:30 p.m.
June 17-21, 9 a.m.-12 p.m.
July 15-19, 9 a.m.-12 p.m.
June 10-14, 9 a.m.-12 p.m. Grab your hard hat! Students will spend the week using engineering and architectural skills as they build with different materials including boxes, recyclable materials, Legos, and wooden blocks. We will read books to creatively generate ideas and then learn how to carry out a plan to put ideas into action. Instructor: Jennifer Landon, Wellington Lower School teacher Grades: Prekindergarten-Kindergarten July 22-26, 9 a.m.-12 p.m.
July 8-12, 9 a.m.-3:30 p.m.
July 29-August 2, 9 a.m.-3:30 p.m.
Let’s start at the very beginning! Focusing on proper technique will help students’ voice be heard while singing favorite songs from Disney classics. Columbus Children’s Theatre’s professional teaching artists have years of vocal pedagogy training and can assist young singers in finding their voice. The weeklong program will focus on posture, breathing and breath support, and placement and vowel formation for singing. Students will begin to read music and know what a half note, whole note, and eighth note are, as well as where a middle C sits on a treble clef staff. The whole class will sing a song (or two or three) for family and friends on the last day. Instructors: Columbus Children’s Theatre staff Grades: 2-4 June 24-28, 9 a.m.-12 p.m.
June 24-28, 9 a.m.-12 p.m.
9 a.m.-12 p.m. 9 a.m.-12 p.m. 12:30-3:30 p.m.
Fossil Hunt: Can You Dig It? 9 a.m.-3:30 p.m. 9 a.m.-3:30 p.m. 9 a.m.-3:30 p.m.
Robots come in a variety of shapes and sizes and are each designed to perform unique tasks. In this program, students will develop a basic understanding of how robots are designed and programmed to use in the real world every single day. They will then have an opportunity to create their very own designs and program their robots to move and perform jobs ranging from lifting simple objects to cleaning up large-scale natural disasters. Instructor: Engineering for Kids of Central Ohio staff Grades: 1-3 June 24-28, 12:30-3:30 p.m. Courses A-Z Let’s Have a Party! Grades: 1-3 July 22-26, 9 a.m.-3:30 p.m.
Little Medical School®: Is there a doctor in the house? June 17-21, 12:30 p.m.-3:30 p.m.
Grades: 1-3 July 15-19, 9 a.m.-12 p.m.
June 3-21, 9 a.m.-12 p.m.
June 3-7, 9 a.m.-12 p.m.
July 8-12, 9 a.m.-12 p.m.